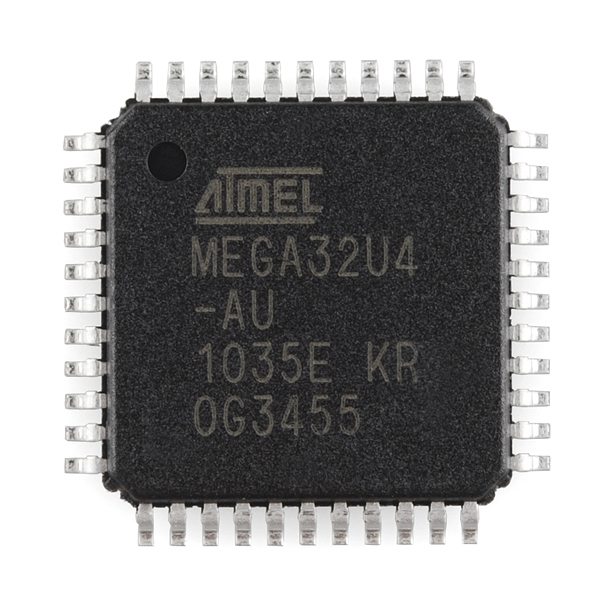 The ATMega32U4 is Atmel's low-power 8-bit AVR RISC-based microcontroller featuring 32KB self-programming flash program memory, 2.5KB SRAM, 1KB EEPROM, USB 2.0 full-speed/low speed device, 12-channel 10-bit A/D-converter, and JTAG interface for on-chip-debug. This is the same controller that's used on the Pro Micro and Fio v3. Hey sparkfun! The datasheet link on this page is broken. thanks for the heads up. 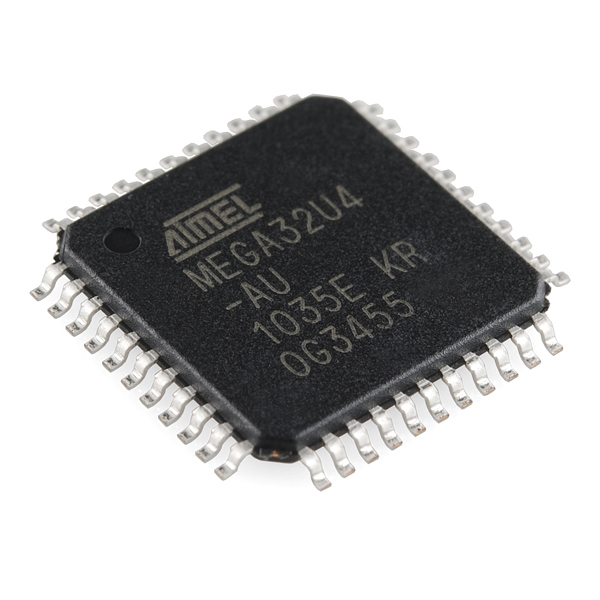 I think Atmel redid their page recently. I'll see about getting that updated, until then this link should work. we might be offering it with the bootloader installed. that's still up in the air right now. It would be just amazing if there was a version with Arduino bootloader setup! Extremely useful! We've toyed with the idea, but it's hard to get the bootloader on an SMD package. especially when we sell the volume of these that we do. doing a few is OK, but doing thousands at a time presents a challenge. Make it a crowd sourced engineering round table video series, a neat automated programmer that takes the chips off the real and programs them with an smd zif socket! +1 for Arduino Bootloader installed! Hello dear friends! I want to buy this chip, but I would like to know whether it comes with the pre-installed Arduino bootloader or not? Does anyone know if my sketch written using Arduino Uno library work on this one? Thank you guys! This does not come with any code on it (including an Arduino bootloader). As long as you have access to the ISP headers and an AVR programmer (or an Uno programmed to be an AVR programmer) you should be able to upload code once the IC is on your finished board. That's actually the way we do it around here. As for the sketch/library it just depends. Most will work, but there are differences in the 2 chips (I2C pins, SPI pins, interupt pins, USB serial vs hardware serial). Depending on the library/sketch it might just work, you might have to change a few pins, or you might have to do a lot more work. Feel free to email techsupport@sparkfun.com if you have any other questions. Not sure if it is just me but there is a 32u4 in the sparkfun library but it is only the QFN-44 package is this correct seeing as this part has the little eagle logo? Thanks just looking for clarification! Whoops, just missed adding it. Thanks for catching that! I just posted an update to the github repo with a TQFP footprint added to the ATmega32U4 device in SparkFun-DigitalIC.lbr. I can't find this part in the eagle library. I can only find the QFN package. Do they have the same footprint? EDIT: Also, can A0-A5 be used as Digital IO? You're correct that A0-A5 can be used for digital I/O, but there are quite a few pins which cannot be used for digital IO on most microcontrollers. In no case can you use VCC or Gnd as I/O. This is obvious. For this chip, if you (sensibly) lump AREF, AGND and AVCC into this category, you lose 9 of the 44 pins to power and ground. In most cases, at least some of the oscillator pins are only for connection to a crystal. 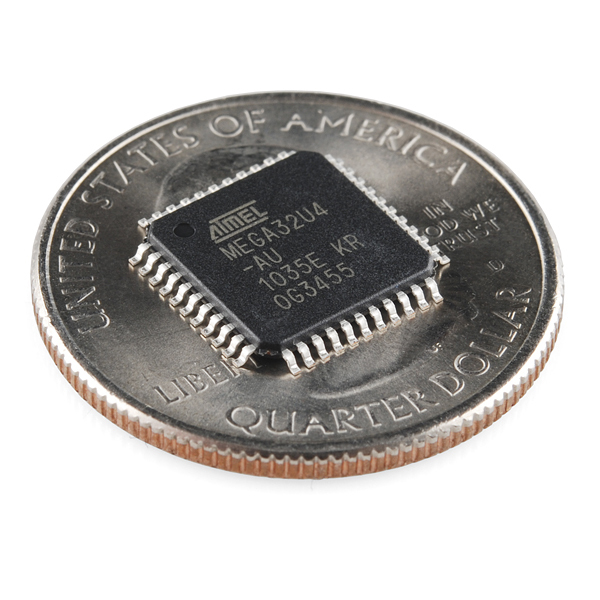 For this chip, that's XTAL1 and XTAL2. This doesn't usually include timer inputs for RTCs. This chip has some pins dedicated to USB functionality. Sure, there's I/O happening, but this isn't ordinary CMOS I/O. This includes D+ and D-, UVCC, UGND, UCAP, and VBUS. As an outlier, many small chips let you use the !RESET pin as I/O. Of course, this means that you loose this easy way to get a clean reset and need to resort to soft resets on some multiplexed switch or complete power cycling, which may not be acceptable. This is usually bad practice unless you're extremely space-constrained and have no room or use for a reset switch. Most every Sparkfun project does have room and have a need for a reset switch. This is very timely. It could very well be the brains of my lasertag project. Thanks SparkFun! YES!!! I asked Nate for this a while back, and had thought I had been forgoten. Well, homemade Pro/Fio clone, here we come. Man I can imagine all the uses of a arduino platform without of a FTDI or ATMega8u2 as a usb interface. I used this part on a "poor mans Thermal Imager" I am working on. If you set it up it works pretty good. The embedded USB needs an extra driver but the arduino IDE handles that.